I quit scrapbooking when Ben died. I had spent the day before at the beach working on my scrapbooks. But after a tragedy like that I couldn't even think about scrapbooking. I packed all my supplies away, and I hoped that I would be healed enough one day to continue them. The time came in 2009 on Alec's 14th birthday. I decided to get out his baby scrapbook that was finished through his first birthday while we were celebrating with family. We were all enjoying his book and that's when it hit me that I needed to start doing something with my pictures again. I actually did feel like a whole person again by this time (11 years later) and I wondered why I hadn't done it sooner. But I got sidetracked (in a good way). I went to a local scrapbook store and heard about a one day photography class that was being taught by Karen Russell whom I had never heard of at the time. In fact I don't think I had ever even visited a blog. The class was fabulous and I got really interested in photography which resulted in this blog about a year later. Luckily I also found Project Life in late 2009. That made documenting the everyday so simple and sort of eased me back into this hobby. 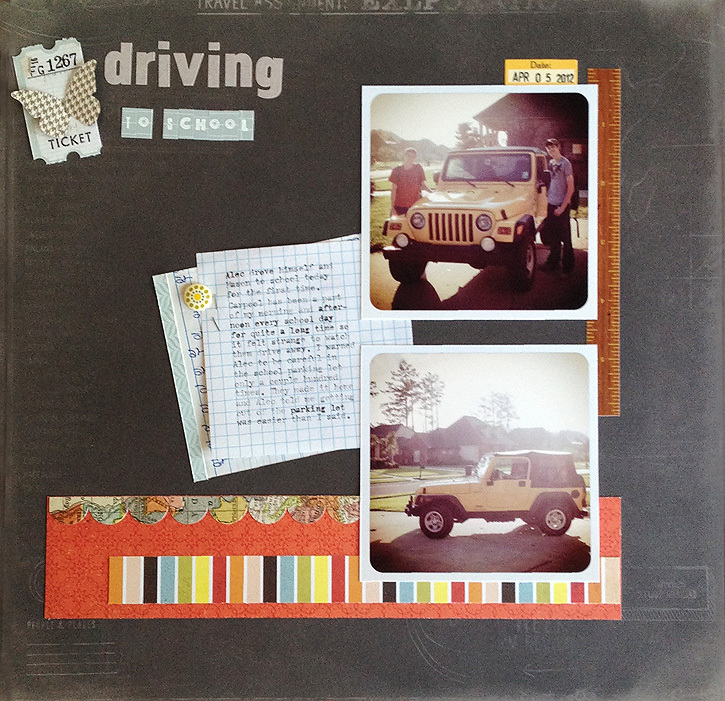 I am now starting to get back into scrapbooking layouts other than just my Project Life pages. I'm not worrying about being "caught up". I will go back and make pages from the past when I want to, but I don't feel like I have to go in order like I did back when I started. I am going to scrap whatever random photos I feel like for the time being. and the first day Alec drove to school. I even made a page about Gary and me on our 8th anniversary last fall. I had an epiphany after making these pages. I realized that I had been putting off scrapbooking partly because of my guilt about not having the books finished from their baby and toddler years. I finally decided that I can't worry about what isn't finished. I'm going to have fun with it. If I get around to scrapping old pictures, that's great. But I'm not going to let undone pages get in the way of enjoying this hobby that I love... so glad I finally figured this out. These look great - so glad you've begun to scrapbook again - good on you! I like project life for the simplicty of it. I put all my pictures into an album, but the added flare of PL and being able to write more is for sure appealing! Have fun as you continue back on your scrapping journey! Beautiful, Deb. I used to draw all the pictures in my kids' baby books when they were little, then when they hit their toddler years I quit taking pictures and filling their books. That is one of my biggest regrets, I missed so much. Now only two of my five kids like having their pictures taken. Sigh. I'm glad youre documenting, such a sweet way to remember. Deb this is such a delightful post and the scrapbook pages that you have done are lovely, and know you are enjoying doing each one of them in whatever random order that they happen in. I love scrapbooking and think it is such a wonderful process for meditating on your life and also for just remembering. Lovely pages that you are doing! I just love that photo of you & Gary. Makes me smile! It is a comforting feeling when we discover truths about ourselves. I am so glad you are back at this because you sore are talented at it! Beautiful and heartfelt post! I am glad that you are back to scrapbooking again; not only Project Life but, actual scrapbooking pages ... my boys love those the most!! Thank you for the reminder to get back to what matters most and what our passions/hobbys/love are! You are an inspiration! lovely pages you've put up! You are very good at scrapbooking. These pages are great! It's a good thing you picked it back up! What a great post! Your scrapbooking skills are one of a kind. Looking forward to seeing the next book! 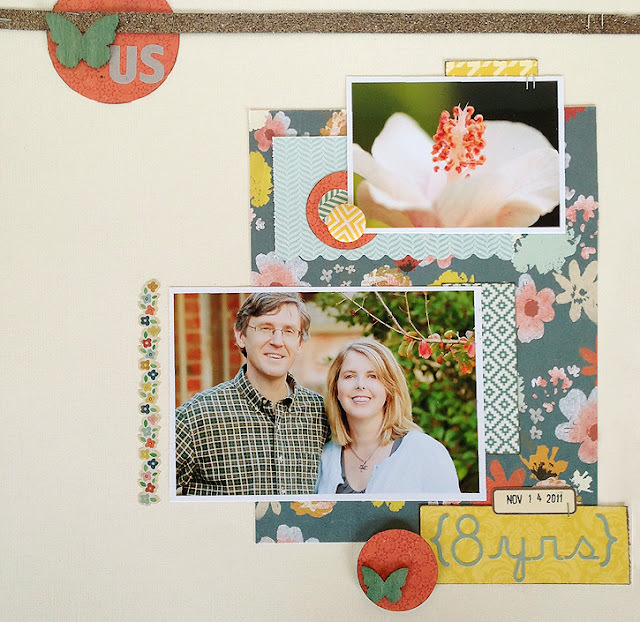 These layouts are simply wonderful, Deb! Real treasures for sure. I'm glad you've decided to come back to something you love to do. Whatever photos strike my fancy, that's what's next. thanks for sharing your story deb. Yesterday we should have celebrated my sons 16th birthday. We lost him 10 years ago. Scrapbooking and photography have forced me to find the joy and happiness in my life...and I have a lot to be thankful for. I SO relate to this!!!! I am way to caught up in scraping cronilogicly that I'm not doing it. You just made me realize that. UGH!! But thanx! I'm going to print soem pics of the most recent pics on mycamera and scrap them now! Thanx for the boost!! !